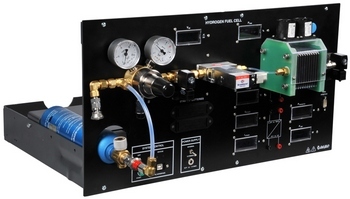 Lab-Volt now offers a Hydrogen Fuel Cell Training System, designed in a modular format to integrate with our existing EMS systems and further expand our 8010 Series of Renewable Energy Training Systems. Lab-Volt’s Hydrogen Fuel Cell Trainer components and curriculum are offered through a partnership with Heliocentris, the world’s leading authority on fuel cells used in education. CopyRightsc2006. All Rights Reserved to Airex. design by JULY info.